Now that #NakedTeachingDay is over, you can fire up your iPads, switch on the IWB and crack open the big pen box again. It was only ever one day without resources; one day, imagined to get teachers feeling what it might be like to go every day without. 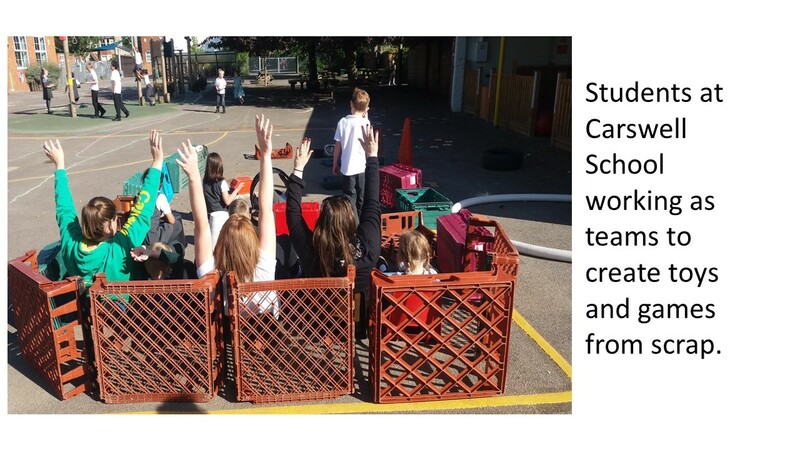 Many schools like Framwellgate (above) and Carswell School (below) looked like they were having a ball! Tables and chairs were removed, whiteboards were switched off, rubbish was used to create toys and human interactions were happening all over the place. These two schools also added a good chunk of much needed cash to our total… Thank you! The funds raised go towards improving the quality of education in places where it is currently lacking; I’m not talking about fixing the photocopier in our local ‘requires improvement’ comp. I’m talking about providing basic equipment and teacher training for schools in war torn countries, refugee camps or areas of natural disaster. Although teaching ‘naked’ could be fun for a day, imagine if that was your every day. The places that WWEP support don’t get to switch the iPads back on in the morning. 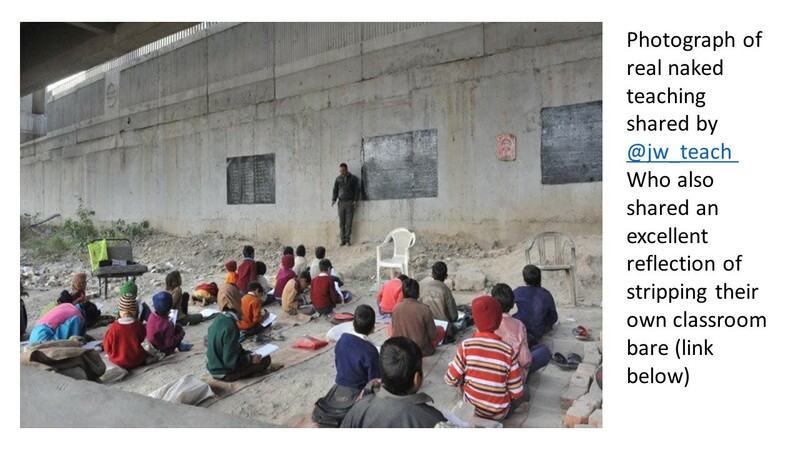 Their teaching takes place without resources, often without rooms. When I first imagined doing something to raise awareness, my thoughts were focused on gratitude for what we have (although #Gratitude4Ghana wouldn’t have had quite so many hits as the naughty naked hashtag). We have so much stuff: nice schools, classrooms, computers, Wifi, paper, pens… and yet, we will complain when the stock cupboard runs low or the signal is slow. We can be spoiled by all we have and I hope it did teachers good to take stock. I hope they felt gratitude enough to give a little to those who have nothing. I remember one teacher, who had come for interview, had trouble with their resources. Their Powerpoint wouldn’t load up as it was incompatible with our systems. She refused to teach the lesson as the resources were inadequate. Needless to say, she didn’t get the job. Resources are not what make a teacher great. Knowledge, an ability to question, understand the purpose of their subject for the child, an ability to adapt, build relationships, communicate, reflect and weave learning through stories, modelling, questioning (the list goes on) is what separates the teachers from the bankers. Teachers can (and do) achieve all of that without projected images or going through reams of paper and ink. When Crista and I travel to Ghana this month, we need to remember that their educational needs are different. Their culture, facilities, opportunities and issues are not the same as ours. We need to ask, “How can we make a positive difference to this unfamiliar context through education?” Imagine if I rocked up in Ghana and told leaders that a monthly mockstead and purple pens of progress would fix their country’s problems. Our way of doing things is damaging enough to our own schools without inflicting it on others. Ghana has millions of orphans and close to a third of children not in any kind of education. Girls are the least likely to be educated. With a life expectancy of 60 years compared to our 81, there are not enough medical personnel to care for the ill. We might complain about our NHS but at least we have one! Children are working on cocoa plantations, the country’s main economic activity, to support their families. Ghana also has a rich history, many bilingual citizens, ancient architecture and lots of promise for future economic possibilities. This is a different world to what we are used to but education has the potential to improve lives there just as much as it does here. Isn’t the fundamental purpose of education to make our world a better place? Each generation get a very short time to play on this planet (shorter in countries like Ghana). Shouldn’t that short time be the best it can possibly be, leaving more of the best to come for the little ones coming next – in whichever context they live? The news reports of bombings, terrorism, war, refugees and global unrest terrify me. Watching politicians try to figure this out is even worse. “A bomb has been dropped, let’s stop this by bombing them back.” They’ve probably all been taught about the events of 1914 at a well resourced school and perhaps even achieved high grades in an exam all about it. But have they learned from it? Civilian casualties are collateral damage to the suits at the top, a necessity to win the fight. Many of the lessons being taught on #NakedTeachingDay could help the next generation avoid making the same mistakes. We need to create awareness in ourselves and our children; they need empathy if they are going to be part of the solution. 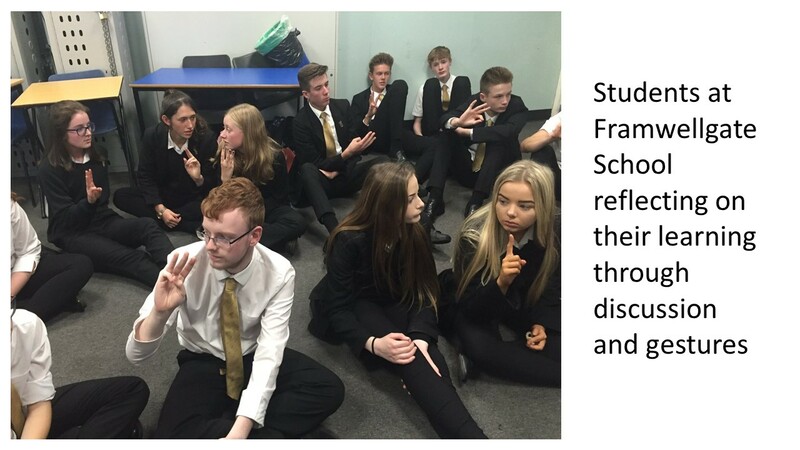 Schools on #NakedTeachingDay put debate, knowledge, questioning, philosophy, team work, articulation, adaptability, creativity (when faced with nothing but scraps) into their lessons. I fear that nothing but scraps could be left for the next generation if we do not figure out another way – there isn’t an app for that. Just because we have what we have today, does not mean we will have it tomorrow. Don’t get too comfortable. We could, very soon, be the ones with nothing as the chaos affecting millions around the world reaches us. It could be our children in the refugee camps. It could be our children orphaned and seeking help from SOS Villages. It could be our children that WWEP turn their attention to helping. All of the arguments about grammar schools, progress 8, gimmicky teaching and PISA scales would be useless if we were hit hard enough by natural disaster or war. Getting to the heart of education, stripping it bare and asking the question: “What the hell are we really teaching them for?” is a far more productive argument to have. It could help our children towards creating the peaceful world that we have failed to bring them into. #NakedTeachingDay was fun but the purpose behind it is far from a barrel of laughs. Forget the borders! We are all part of one world and, as educators, we have the power to teach our children how to make it better for the future. 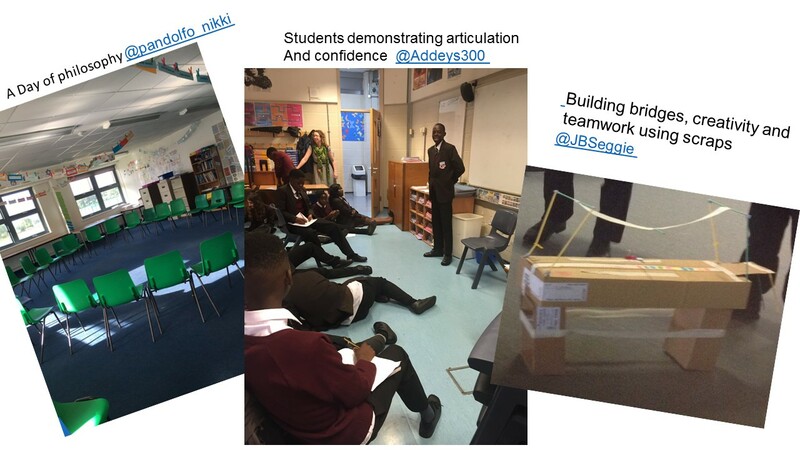 Thank you to all who took part in the first ever #NakedTeachingDay and I look forward to reporting how your ideas go down in the SOS Villages of Ghana later this month. If you can give anything to support the work of WWEP, click this link for details.